© William Harvey, 2019 - do not reproduce any content without prior permission. A couple of miles off the coast of North Berwick, in the middle of the Firth of Forth, stands a massive lump of volcanic rock. Despite its imposing appearance, the Island has been inhabited by humans until relatively recently. There are records of the Bass being the site of a Christian Hermitage back as far as 600AD. During the 13th century, the Scottish Nobleman Robert Lauder built a fortification on the site, which was purchased by the Crown in 1671 and was used as a prison for a number of decades. In 1902, a lighthouse was built on the Rock, designed by David Stevenson, cousin of author Robert Louis Stevenson, who features the Bass in one of his novels. Whilst still in use, the Lighthouse has been automated since 1988, leaving the Island free of human inhabitants. 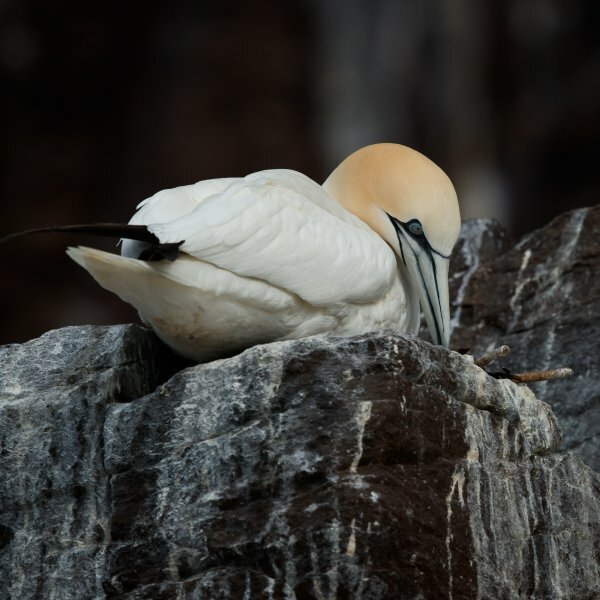 Since the humans left, another inhabitant of the Rock has thrived – the Northern Gannet. A gannet flies across the face of Bass Rock, in front of a small number of its 150,000 or so compatriots. An aerial survey conducted in 2014 counted in excess of 150,000 gannets on the Bass, a number which represents almost one fifth of the global gannet population, and makes it the largest breeding colony of Northern Gannets anywhere in the world. The colony is so densely packed into the island’s 3ha area that, viewed from a distance, the Bass appears almost totally white. It is something of a wildlife success story too. The figure established by the 2015 survey represented a 24% increase on the previous population survey, carried out just six years earlier. Such is the significance of Bass Rock to the global gannet population, it even lends its name to the Gannet’s latin title; Morus bassanus. The gannets are not present on Bass Rock all year round. They arrive from February, and stay until around October. During their time on the Bass, they will build a nest, mate, and lay usually a single egg, which they will incubate for around 40 days. The rest of the year is spent at sea, with birds flying as far as the Bay of Biscay and the West Coast of Africa. A gannet carrying seaweed to be used in nest building. 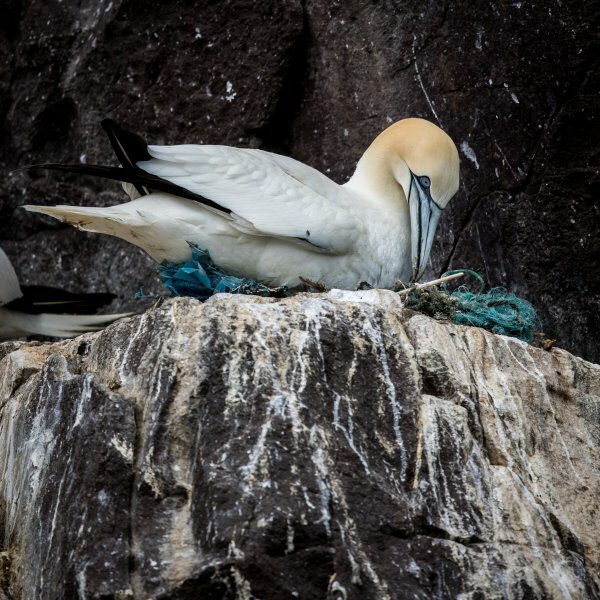 Gannets build their nest out of earth, seaweed, and other objects that they can scavenge from the sea. Unfortunately, this can include unsuitable, and potentially harmful materials, such as discarded netting and plastic, as can be seen in the nest to the right. The exposed positions the nests are built in mean that it’s not uncommon for them to sustain damage across the course of the breeding season, so they require constant maintenance and repairs. Nesting sites are usually chosen by the male birds, who will also carry out much of the collection of nesting material. A pair of Gannets courting. Gannets are monogamous, and will often mate for life. Courtship is initiated by the female bird, who will pose with her neck outstretched to indicate her availability. Males will shake their heads, and the birds will rub bills. Gannets are monogamous and will often mate for life. The do separate when their chicks leave the nest, but they will pair up again when they return to the breeding ground the following year. Despite the fact they build their nests in close proximity to each other, they are fiercely territorial and will fight with neighbouring birds to defend their site. Gannets will feed their young for up to 12 weeks. Young chicks will be fed semi-digested fish, regurgitated by the parent bird, while older chicks will be provided with whole fish. Young gannets normally leave the nest after around 75 days, gliding down to the sea. They are unable to fly properly at this point, so are unable to return. They generally have enough fat reserves to survive for two to three weeks, while they learn to fish and fend for themselves. Young gannets are almost completely brown. They gradually lose their brown feathers as they mature, and can take up to 5 years to reach full maturity. Collecting fish involves a rapid dive into the ocean. Gannets can locate prey from heights of up to 45m (148ft). Once they have established a target they will start their dive. They hold their bodies straight, using their wings to steer them in the descent. As they approach the surface of the water, they pull their wings close to their body, with the wing tips extended back beyond the end of their tail. During the dive they can reach speeds of up to 100km/h (62mph), and reach depths of 3-5m (10-16ft). They will usually dive deeper than their prey, and capture it on the way back to the surface. A successful catch will be swallowed before they return to the surface. All content (c) William Harvey - Do not reproduce any content in any form without prior permission.